Now in paperback, today's most celebrated writers explore literature and the literary life in an inspirational collection of original essays. 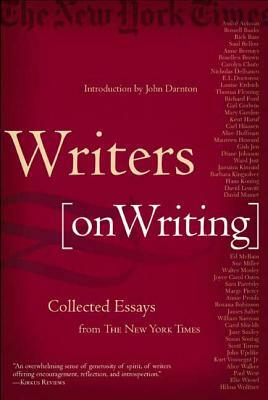 Contributors include Russell Banks, Saul Bellow, E. L. Doctorow, Richard Ford, Kent Haruf, Carl Hiaasen, Alice Hoffman, Jamaica Kincaid, Barbara Kingsolver, Sue Miller, Walter Mosley, Joyce Carol Oates, Annie Proulx, Carol Shields, Jane Smiley, Susan Sontag, John Updike, Kurt Vonnegut Jr., Alice Walker, and Elie Wiesel. John Darnton, winner of the Pulitzer Prize and the George Polk Award for his journalism, is culture editor for The New York Times and the author of two novels, The Experiment and Neanderthal. He lives in New York.